My husband makes it a tradition every Halloween to make our daughter (she is 5) a homemade costume. This year, since they both love Star Wars (she probably knows more about the characters and the movie than most adults) they decided she wanted to be a Stormtrooper. 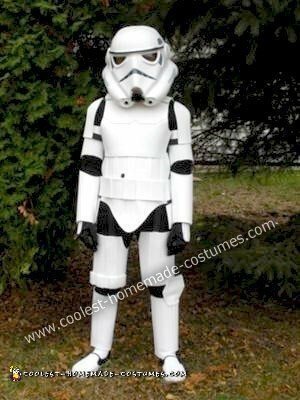 He spent about 7 hours over the course of several weeks making the Homemade Stormtrooper Costume. It is make from white and black craft foam, elastic and velcro and is held together with hot glue. Her black suit is just a black turtleneck and leggings and her shoes are Walmart canvas shoes, spray-painted white. The only item not made was the mask, which was formerly attached to an old dress-up police helmet. Needless to say, all the hard worked paid off since it turned out great and my daughter loved it! Every year family and friends tell my husband that he should enter a Halloween contest, so this year we are giving it a shot. My son wants to be a snow trooper and I bought a police helmet too. Can you give more detail in how you turned your helmet into a storm trooper helmet?